The first local theatrical showing of a digital restoration of E. A. Dupont’s silent masterwork Varieté (1926) warrants notice on this page primarily because its remarkably satisfying live accompaniment resulted from the four-month effort of students and their guru at a major Boston conservatory. One of the few examples of great art from the milieu of artistes, Varieté transcended the backstage circus genre through the genius of great actors, director and cinematographer to apotheosize the form. 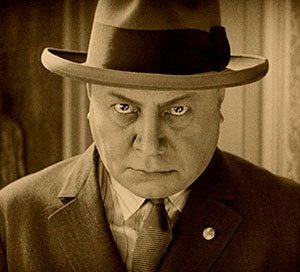 Leading German actor Emil Jannings could smolder and fume like no other. His total command of face and entire body allowed him to inhabit a tremendous range of roles. 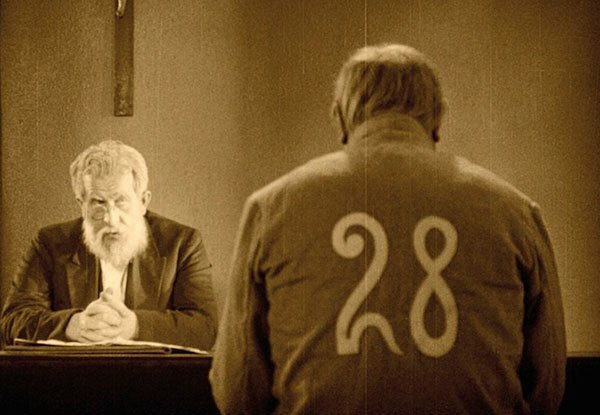 As the film begins, prisoner number 28 emerges from his cell in a bent stoop that is so evocative that it nearly tells the entire story. His emotional state can be read on his back. There is an operatic quality of large gesture to silent film acting that a good score can enhance and an inappropriate score can shatter. The music should read the inner souls of the actors (comic or tragic) and support, foreshadow and respond, but never mimic. With a great marriage of music and film, the visual and sonic rhythms fit inevitably together. The camera work of and setups of Karl Freund also mirror the emotional states of the actors with forced perspectives and acrobatics as well as dreamlike fantasy. Yet viewing the film in absolute silence distances one from the feelings, and the effects become stunts. Readers should understand, though, that silents were never presented in silence. The best had through-composed scores commissioned and sanctioned by the directors. When those are available, they should be used (except maybe when teaching composing students). The intended music should not be divorced from the film—unless it is bad music. Yet modern improvised or travesty scores that seek to update the film or attract undue attention to the composer/performer can totally upend the required suspension of disbelief. They have unfortunately become far too common. Berklee Silent Film Orchestra (BSFO) avoided those pitfalls with a score that alerted sensitively and tastefully to mood, sounds, and editing. The six students who worked under professor Sheldon Mirowitz have succeeded, where the original film music, based on popular songs by the English tunesmith Vivian Ellis, failed [Hear examples of his work here and here]. The Murnau Stifftungs’s recent release of the restored picture on a much anticipated BluRay came with a maddeningly ugly score that made the film unwatchable. That the greatest film restoration company could perpetrate such as disaster was the talk of the Stumm Film cognoscenti. Hearing from Coolidge’s Martin Norman that Kino-Lober will be packaging its American release of the restored BluRay with BSFO’s work left us with some blessed relief. Norman launched the Coolidge Corner Theater’s “Sounds of Silents” in 2007 with a mission to present classic silent cinema on the big screen, accompanied by a live original score and performed by outstanding musicians. On the evidence of last night’s performance, they have succeeded in great style. The BSFO has scored and performed nine iconic silent features including F.W. Murnau’s Sunrise [warning: we declare it to be hubris to violate the great marriage of the greatest silent film and score], Faust, The Last Laugh, Clarence Badger’s It, Sergei Eisenstein’s Battleship Potemkin, Buster Keaton’s Our Hospitality, E.A. Dupont’s Piccadilly, and Rupert Julian’s The Phantom of the Opera, each commissioned by the Coolidge Corner Theatre’s “Sounds of Silents” program. Berklee Silent Film Orchestra will bring Varieté to San Francisco Silent Film Festival on June 3rd, to the Cabot Theater of Beverly on June 17th and, on June 23rd to the Martha’s Vineyard Film Center. FLE: How do you get six composers to write as a single unit and make a single coherent score? SM: It’s all based on a “score bible” of themes that I make, and then we meet twice a week and show and share our work. It is HIGHLY collaborative, and I have a (large) hand in guiding everything so that the vision is singular. Where do you come down on the motif for characters versus generalized music for action divide? All effective scoring is based on themes. Generalized “type” music will always be just that—generalized—when everything in a movie should be specific and particular. Using “type” music in a movie is like a movie using a “generic action sequence” whenever any action was taking place. Or having an actor who has a “sad” face that he uses whenever he is supposed to be sad. It’s not how acting, or movie making, works, and it will never tell the most compelling story in the most powerful way. Do you screen any travesty scores as examples of what not to do? 1)We don’t write in a “silent film” style—a film is a film is a film. The issue is the story and the story ONLY. 2) We don’t speak down to the audience. 3) We do not score the PICTURE. We score the STORY. 4) We try to understand the story completely (this is more challenging for silent films because of the gulf of time and cultural difference that we need to traverse to get to the story) and then present it in a way that understands and illuminates it on every level on which it speaks. Much of this is SUBTEXT, and much of this is NOT what is happening ON the screen. 5) Our primary job in the score is to help the audience feel. Our work is primarily “emotional”. In Silent Film this can be confusing, because there are so many actions that will need accentuation, so we need to do a lot of “narrative” work as well. 6) We do not do everything—that will obliterate the audience’s participation in the film. 7) Score is basically accompaniment—this is not less true of silent films. So we need to stay out of the way so the movie can speak. 8) It is NEVER about the music. Some of the circus music sounded vaguely familiar. None of the music for the film was from any other sources. The circus music was all originally composed. Everything was originally composed. If it sounded like it was compendium, that is a testament to the skill of the composers. What can your students expect professionally after this program? These composers will work in the field. LA is populated with graduates of our program, and particularly students who have gone through this course. It is unbelievably valuable to them in their current working lives. You should find one of them and discuss it with them if you want to know. The process of collaborating on scores is the basic way that all film composing is done. All of the techniques and skills they work on in this class (writing for a complete film, using themes, focusing on story and not on picture, collaborating with others, preparing scores for performance, conducting, etc.) these are used daily by our graduates in their lives as film composers, composer assistants, ghost writers, music editors, etc. Lee, Your headlines get better and better! Berklee College of Music Silent Film Orchestra (SFO) performance of Varieté was simply amazing. I was in the audience at its premiere at the Coolidge Corner Theater. For those fans of silent film and classical music treat yourself and see this significant film. Varieté will be performed at the Martha’s Vineyard Film Center on June 23rd with music to picture score performed by the Berklee student SFO. It opens the Filmusic Festival that weekend.